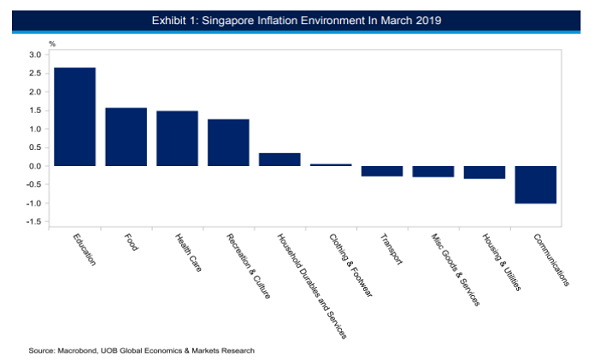 What do 9 months of manufacturing decline mean to Singapore economy? The current period of contraction beats global financial crisis records. Singapore’s Industrial Production (IP) declined 5.4% y/y in October. This is the 9th consecutive contraction in Singapore’s manufacturing sector as weak external demand had added on to the woes of manufacturers in Singapore. Excluding biomedical manufacturing, IP fell 6.4% y/y. Looking at the time series of IP since 2003, the current period of contraction is longer than the six months of consecutive contraction back during the global financial crisis (Oct 2008 to Mar 2009). However, the magnitude of decline this time round is relatively smaller than during the 08/09 crisis period; The average IP contraction during this period is 5%, whereas during the crisis, the decline averaged 17% y/y. Similar to previous months, October’s manufacturing decline was broad-based, with the exception of the chemicals cluster that rose 5.5% y/y. At the opposite end of the performance spectrum, electronics output decline 14.0% y/y, as semiconductor output declined for the 9th consecutive month to register -16.6% y/y. Singapore’s manufacturing sector is not out of the doldrums yet. The sector continues to be weighed down by very weak external demand amid the global deflationary environment. Economic and political uncertainties plaguing the Eurozone, US and China (our top exporting destinations) remains and will continue to drag on the confidence of manufacturers and exporters. In addition, Singapore’s still-tight domestic labour market remains a supply-side constraint for production. Within the manufacturing clusters, uncertainty plagues the transport engineering, electronics, and precision engineering sectors. However, we remain optimistic that there could be some pickup in manufacturing growth in 2016. First, we expect the economic conditions in the US to continue on an improving path. Better jobs numbers, stronger wage gains due to the tighter labour market, and a stronger USD will see the rise of consumption demand from the average American. Second, the basis effects from the low base in 2015 will provide some support for growth. We further downgrade our 2015 industrial production forecast growth to -4.0%, from -2.0% earlier, while forecast 2016 industrial production to grow 2.5% on the back of the reasons above. yoy in Oct, vs. -4.7% (revised from previous -4.8%) in Sep. Excluding biomedical manufacturing (-1.6%), output fell 6.4%, still weak but better than the 10.1% decline in the previous month. IP weakness was led by electronics and precision engineering. Electronics output declined 14% from a year ago, vs. -8.6% in Sep. This is despite gains for data storage and other electronic modules & components segments. Precision engineering contracted 6.9% (vs. -9.2% in Sep), hurt by weaker production of modules & components (industrial rubber, wire & cable products, fabricated metal products) and machinery & systems (back-end semiconductor equipment, industrial process equipment and mechanical engineering works). Transport engineering also continued to contract, but at a much slower pace of -4% vs. -24% in Sep. The segment was weighed down by marine & offshore engineering and land transport segments. Meanwhile chemicals and general manufacturing rose +5.5% and +0.6% respectively. Outlook remains soft, taking cue from the fourth consecutive month of sub-50 reading the manufacturing purchasing managers index (PMI) as of Oct 2015, and the deterioration in manufacturing business sentiment and weak outlook for the Oct 2015 – Mar 2016 period as per the recent ‘General Business Expectations’ survey conducted by the Singapore Economic Development Board. Manufacturing looks set to continue being a drag on the economy in 4Q 2015 as was the case over the preceding four quarters. Nonetheless, despite this prolonged weakness in the manufacturing sector, which accounts for 18% of the economy, we are of the view that the overall economy will grow by +2.0% in both this year and next year (2015 YTD: +2.2%; 2014: +2.9%) as services and construction sectors are expected to expand on the back of domestic demand growth amid challenging external demand environment, reflecting the impact from supportive macroeconomic policies through the recent easing in monetary policy and the room for continued expansionary fiscal policy, coupled with the potential for some reversals in the property cooling measures.